In stock 145 items in stock. Will this make a high-pitched sound like other inverters? some do, some don't. Since I'm making something to wear I would rather not be annoyed by it all day. I would like to hack this, removing the power botton so I can turn it on with an Lilypad (arduino), does anyone know how? The use a simple push button, if you can power a relay with a lily pad that would be your best way of doing so. Burned out from 2 strips -.- Annoyed. Money down the drain. First time using it. Apparently 2 strips was ok, guess not. "Note: Weâve found that while the inverter has no trouble powering two strands of EL wire, it can burn itself out if you attach two EL panels or strips. If you need more than one EL panel or EL tape, you may want to look at our other EL inverters." Any advice for fixing it? what burns out? Email techsupport@sparkfun. They should be able to help you figure out what specifically is fried. Sorry to hear you had these troubles! My inverter has a high pitched hum, I'm guessing because of how it generates the high frequency needed to light the wire. Is there anything I can do to make it quiet? I would like to connect 2 short EL wires to the output of this pack. Do the outputs blink at the same time or is one on while the other is off? Would prefer the later, so if not, would it be easy to hack to get the outputs to alternate? I believe these blink at the same time. I am not aware of anyone attempting to hack these to alternate, but if you are successful in doing it, please let us know! What sort of lengths of wire can one inverter drive? Iâd like to run 4 separate wires with a total length of about 1.5m from just one driver. How easy would it be to add a kind of JST "splitter" to run 4 wires from the existing 2 wire sockets? If you gut this thing to use the inverter with a different power source, how big is the board? Hacked one today , I used the left over barrel jack from the 12 volt inverter ( https://www.sparkfun.com/products/10469) after doing the mod listed in the tutorial for El Wire(https://www.sparkfun.com/tutorials/353). 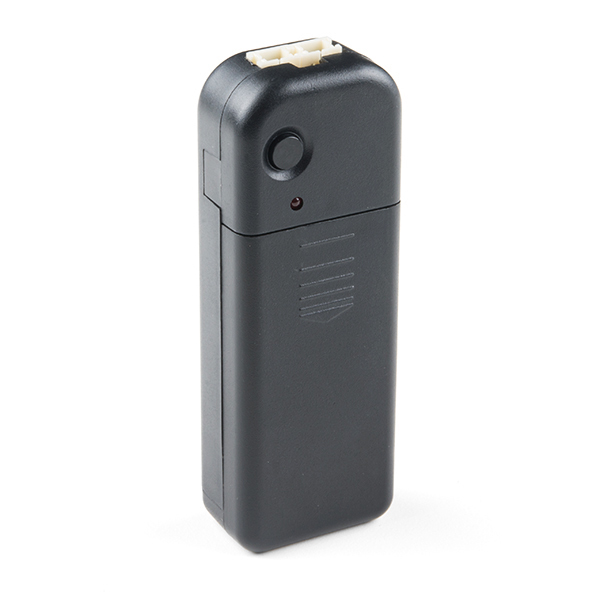 The barrel jack makes it easy to connect to the 4 cell battery pack (https://www.sparkfun.com/products/9835). Ran it for about 5 minutes in each setting driving two of the 3m El Wire strands, nice and bright, no puff. Tried my luck with a 9 volt battery pack (https://www.sparkfun.com/products/10512) it puffed in under a second. Good luck guys. Why did you go up to 9V out of curiosity? I ordered 9 of them since the price was great on them. Had already slated 3 to be taken apart, figured might as well test different voltage out of curiosity. The common point in the thread was that they seemed dim with 3 volts and two strands. So when I saw it worked at 6v wanted to see what would happen at 9v. I know the logic is a bit flawed, but having the barrel jack , and arduino battery packs laying around on the bench curiosity got the best of me. I imagine if you guys would manufacture an inverter with the barrel plug that would allow the choice between power sources it would sell well. Nothing fancy just an on/off switch, maybe powering three 3m strands, possibly compatible with the 9v you guys sell (https://www.sparkfun.com/products/10053) lol. So I just got this, and some EL panel. I threw two batteries in it and tried connecting the panel. There was a moment in which a little glow came from the panel, and then dark. Sniff, Sniff? The smell of dead circuit. Did I: a) do something foolish and not understand how I was supposed to use this gadget, or b) get a unit which was somehow faulty. Anyone? Shorted out my EL panel. Nice. Sorry to hear that! Contact tech support and they'll be able to help you out with that. I bought one of these, here is my feedback. With two 10ft lengths of Sparkfun's EL wire (blue and green): Unnoticeable in daylight, dim but visible in bright room lighting (or with some daylight let in), Bright and very noticeable in average-light rooms, and brilliant in dark rooms. (I realize this information might be more relevant to the wire itself) Inverter easily fits in any pocket. Belt clip is helpful. The input jacks are a little wobbly; nothing horrible has come from this for me. The plastic casing is also a little loose; frankly I am surprised I noticed it though. Overall, it is amazing, the two inputs are EXTREMELY helpful, and I am amazed that it is only $5. I am planning to get several more! Any idea on how to disassemble this? I'm trying to fit it into a TINY build and I want to rearrange the guts. 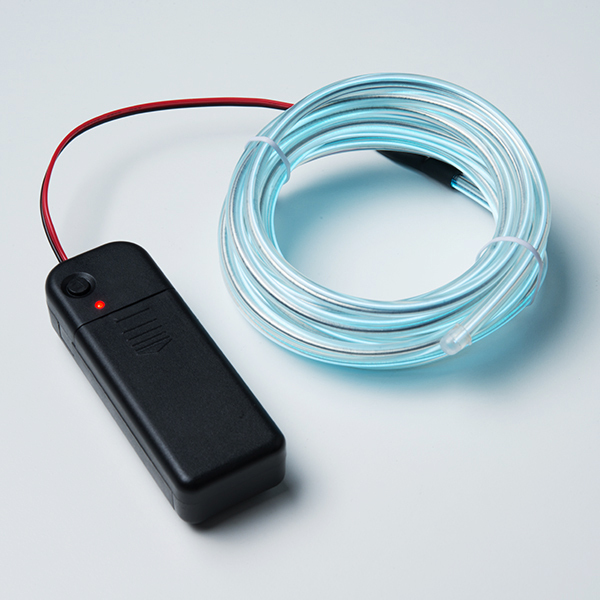 What is the length of el wire this can power? How long a wire (total, across both ports) can you hang off of this and still get a nice bright output? I would assume if it can drive a 3m length, I could make two 1.5m lengths and drive that the same and get the same brightness? As it says in the description, you can drive two 3 m lengths at once. There might be a slight decrease in brightness per 3 m strand but it wouldn't be very noticeable if it existed at all. When would you use COM-10201 (the 3V EL Inverter) and when would you use this? Or is this meant to be used with COM-10201, in which case, is it just a 2AA battery holder with a JST connector? Sorry if these are dumb questions, I've never used EL and am trying to figure out a good starter package. 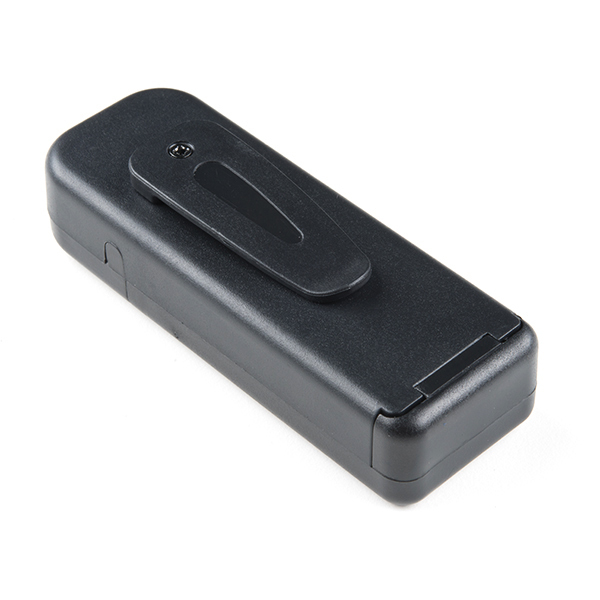 COM-10201 is practically this product without the battery holder, for twice the price. I'm not sure if COM-10201 is more robust/higher quality than this product, thus the increase in price, or if that's just how things are. This product is probably easier to use right out of the box as well, as you don't need to worry about rewiring the connectors or creating F-F adapters. Taking the numbers from above (single 3 m strand draws ~190-260 mA), a rough average of ~2000 mA available for use from alkaline AA cells, and ~2700 mA for lithium AA cells, you get 10.5 - 7.69 hrs of use for alkaline cells and 14.2 - 10.4 hrs of use for lithium cells. This should be more than enough for portable projects, if not you could theoretically attach the 6 Ah battery pack from SparkFun for up to 35 hours of battery life time! My guess would be no but im not an expert. Do not order PRT-10357 (JST SH Jumper 2 Wire Assembly - 8") as a connector for the JST plugs on this unit - it does not fit (too small). It was in the "related products" when I ordered but it is different and will not fit. Hey, sorry about that! You'll want a JST, not a JST-SH. I've related it to this product. What is it that was related to PRT-10357? I can't find it in the history for this item and it doesn't appear to be on the EL wire. I'd like to keep someone else from making the same mistake. Hah, Maybe, Happens to the best of us! One of the connectors broke after 30min of light use. I haven't tried to solder it back together since the other connector still works. As everyone notes, these emit an annoying high-frequency whine. Pack isn't small but it's not hard to hide within a costume. Emits a high whine but it's very quiet compared to models I've bought from other suppliers. I used this for bike lighting. After maybe 150 miles, it failed. I thought it was the connector, but when I took it apart I found that the vibration had caused the traces to the connectors to separate from the PC board. Furthermore, when I tried to fix it by adding a new connector, the force of pushing the case back together caused the traces to the battery connector to fail.